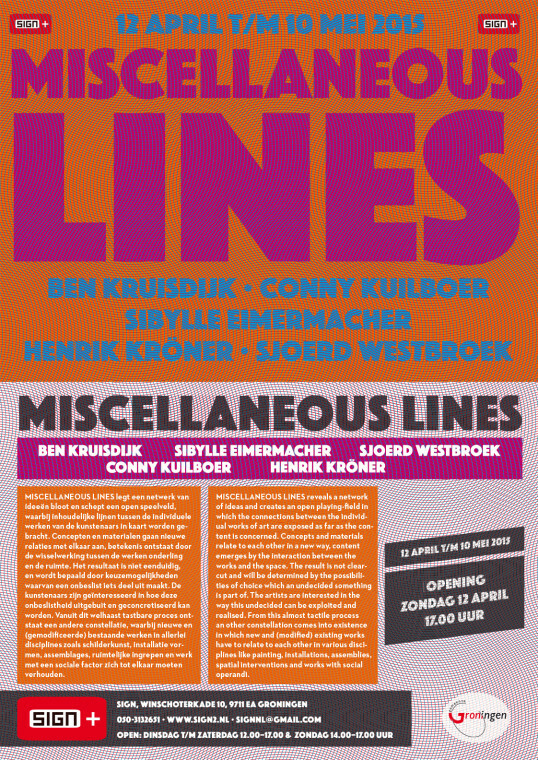 MISCELLANEOUS LINES reveals a network of ideas and creates an open playing- field in which the connections between the individual works of art is exposed as far as the content is concerned. Concepts and materials relate to each other in a new way, content emerges by the interaction between the works and the space. The result is not clear-cut and will be determined by the possibilities of choice which an undecided something is part of. The artists are interested in the way this undecided can be exploited and realised. From this almost tactile process an other constellation comes into existence in which new and (modifi ed) existing works have to relate to each other in various disciplines like painting, installations, assemblies, spatial interventions and works with social operandi.